Hundreds of trees will be planted in urban areas of Chula Vista and San Diego under a $1.75 million Cal Fire program, state officials announced Friday. The trees will go into economically disadvantaged neighborhoods that suffer from pollution, including Chollas Creek and Logan Heights. “Trees reduce carbon that builds up in the air and filter pollution and odors that reduce neighborhoods’ environmental health,” said Lynnette Short, regional urban forestry director for Cal Fire. “By planting the right trees in the right locations, we also can combat the state’s historic drought by capturing more storm water runoff and replenishing groundwater,” Short said. The tree planting is one of several local projects funded by the state’s $2 billion Cap-and-Trade program, which will include $50 million in the San Diego region. Projects funded over the summer include trolley upgrades, completion of the South Bay bus rapid transit system and an affordable housing project located near mass transit in National City. 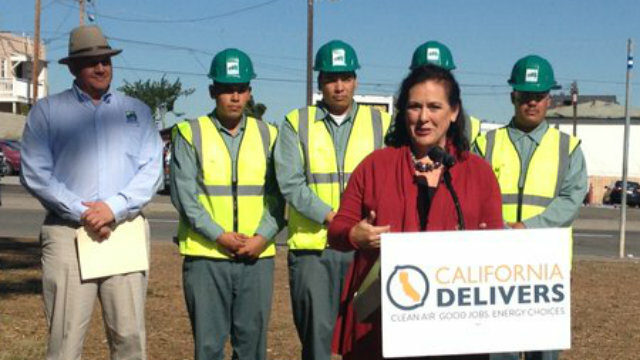 “The state’s climate investments program is helping to reduce climate impacts and protect our environment while bringing vital funding to San Diego for expanded transit, green neighborhoods and affordable housing,” said Assemblywoman Lorena Gonzalez, D-San Diego.